What are maps and what is their purpose? Generally they are used for recording physical features of the land such as rivers, mountains and roads. A map of a city is usually a tool for navigation; working out the best way to get from one location to another. But what if a map was not merely a factual record of a physical environment but a more personal record of our feelings, impressions or memories about a particular place? I have found myself considering all these questions as I contemplate the work in ‘en_counter’. This exhibition was born out of research into how young people in Newcastle and Gateshead relate, respond and connect to their city. 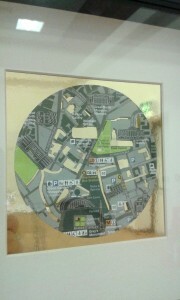 A number of the pieces use maps in a way that challenges our preconceptions and invites us to engage and interact. 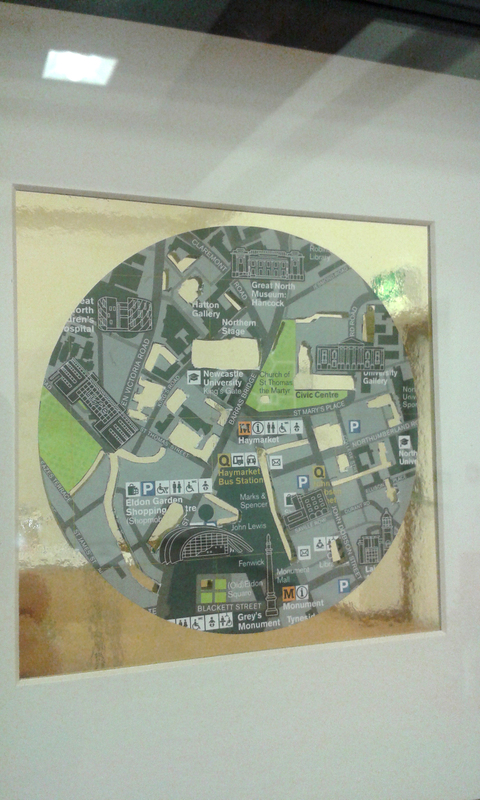 In the piece ‘Maps of Gold’ (2015) created by pupils at the Royal Grammar School with artist Christine Egan-Fowler, ordinary maps are transformed into precious, intricate objects. Significant locations on a chosen section of the map have been cut out and replaced with gold leaf, giving it the flavour of an illuminated manuscript or religious icon. I found that the way in which the segments have been selected and presented inspired a sense of reverence and contemplation. The process seems to have transformed impersonal, public locations into a private, secret places into which we are invited. Jon Swords’ ‘River Map’ (2016) and Lovely Jojo’s ‘Spaces of Homelessness’ (2014) also illustrate how a physical location on a map can hold great personal significance for an individual and evoke strong emotions and memories based on past experiences, both positive and negative. We are all familiar with conventional maps, but what if the physical position of places was not the most important factor? 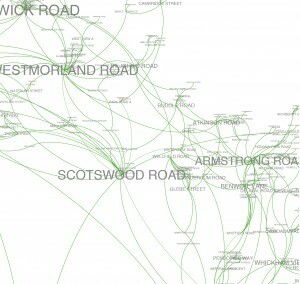 Jon Swords and Bruce Carlisle have produced a ‘Topological Road Map’ of Newcastle, based on the connections between places rather than their geospatial position in relation to each other. 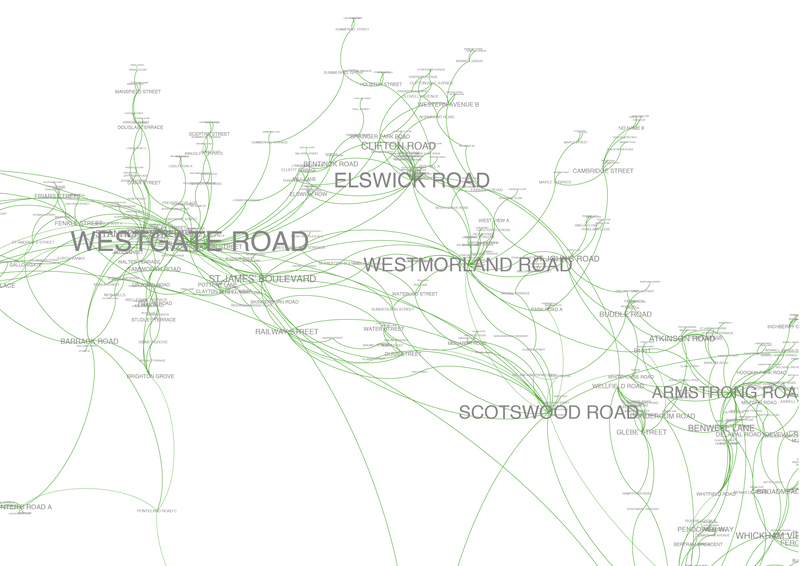 The result is a pulsing, organic mesh of intertwining lines, with locations joined by relationships rather than location. It suggests to me a family tree,the blood-line of a dynasty mapped out in these vein-like threads. Other pieces in the exhibition bear less of a resemblance to maps as we know them, but expand upon ideas of how we draw or record our environment. 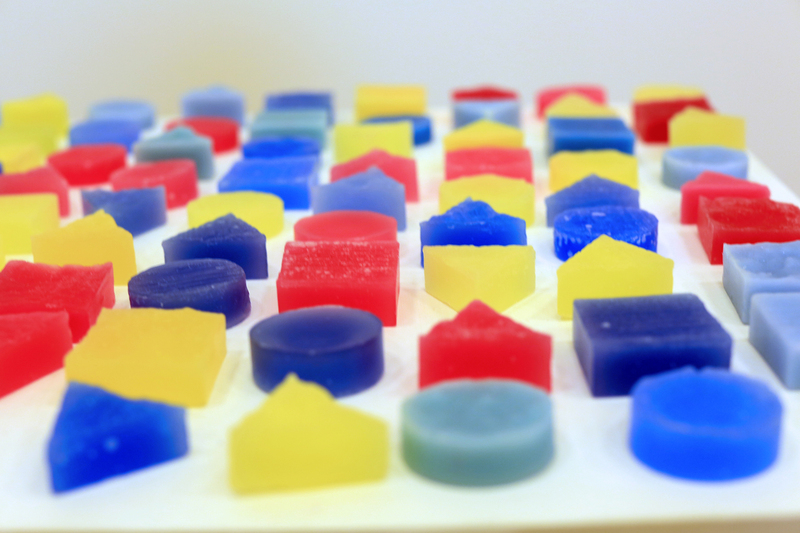 Inspired by the practise by skateboarders of rubbing wax on kerbs and railings to reduce friction, ‘Drawing’ presents us with a collection of colourful shapes made from wax. In themselves, the objects form a visually appealing display, but they are not merely there to be admired. Their significance lies in the invitation to visitors to take a shape with them and use it to embellish or emphasise objects or features in our environment. Whereas a traditional map highlights features and landmarks deemed to be generally significant or noteworthy, we are encouraged to highlight that which interest us personally and might otherwise be overlooked. The vibrant blocks stand like tempting sweets or soaps on the table, gradually depleting during the course of the exhibition like chess pieces as the game progresses. I wonder how many of the pieces taken will be used as the artist suggests. Personally, I am unsure about participating in this somewhat rebellious, subversive behaviour. While I am in favour of finding beauty in unexpected places and celebrating our often neglected urban and industrial surroundings, I am uncomfortable with the idea of physically marking it in this way. The video artwork ‘It’s about Time’ expands on this theme of celebrating the ordinary and the overlooked, with young people from Space2 presenting the city from their point of view, documenting the places they value with vibrant colour and lively movement. I enjoyed the use of light and reflections, the unusual camera positions and the optimistic outlook of this film. These are just a handful of the works on display at en_counter, an exhibition which I have found fascinating and thought-provoking. I hope my thoughts will inspire some of you to come and see for yourselves and form your own response.